Om Unit’s latest EP for London based label Civil Music sees the producer coming with an interesting new take on the 170BPM tempo range. With the exception of Reso’s excellent drumfunk rework of opener Ulysees, the EP’s tracks bear little resemblance to traditional drum & bass, nor the (mostly over-hyped) drumstep shenanigans that have been doing the rounds lately; rather we see music which has more in common with Hip-Hop, Glitch and Dub. All the tracks are steeped in atmosphere and finely crafted, with heavy sub kicks and catchy but understated synth work all over, along with some tasty sub bass – the lowend on Lightworkers Call, a collab with Kromestar, is ridiculous. Fans of dBridge & Instra:Mental’s work as Autonomic should definitely give this one a listen. The Aeolian EP is out July 30th from all good record stores. Noisia have been busy lately, with a massive pile of releases on their own labels and more. Not content with that, the Dutch trio have decided to give away 8 tracks they wrote for the Motorstorm Apocalypse soundtrack, absolutely free! Stream the tracks below or head over to their Facebook page to download them. Marcus Intalex‘s Manchester based Soul:R imprint is gearing up to release the debut album from MC DRS, and ahead of that they’ve put together a quality 12″ taken from the album. The A-side sees DRS teaming up with Russian producer Enei, with tight rhymes over a classic “steppa”-style D&B beat. Over on the flip is Holding On with Lenzman, Jehst & Riya, an altogether more soulful, liquid-funk affair with a warm, uplifting chorus. DRS has also put together a youtube playlist of his influences which features a wide variety of quality tunes from the likes of Goldie, Otis Reading and The Pharcyde – well worth a listen! Check out the video for Count to Ten below, grab the single (out Monday on Soul:R from all good outlets) and watch out for the album over the next few months. Since it’s inception way back in 2001 Dispatch Recordings have been crafting a niche for themselves as purveyors of top notch grimey techstep, and their recent output from artists like Break, Sabre, Silent Witness and Dabs has seen the label go from strength to strength. 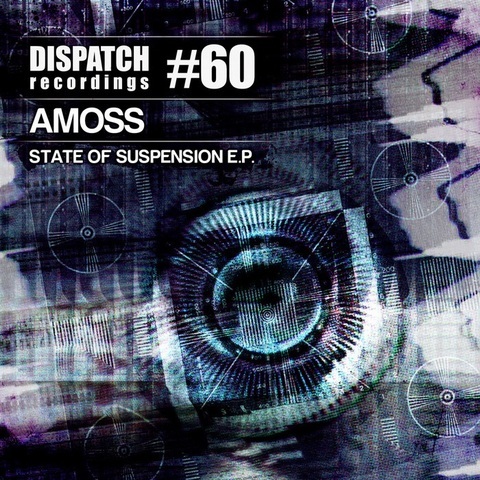 Their latest release comes from Hertfordshire-based production duo Amoss, who have been absolutely carving up the scene recently with releases on Horizons, Inside Recordings and the legendary Renegade Hardware. Crisp breakbeats and dirty, warping basslines are the order of the day here, but the EP retains a deeper vibe than the full on face-smashing neurofunk of producers like Noisia and Phace. The tracks also show an attention to detail lacking from some drum & bass – every kick and snare has been deliberately placed for maximum effect, and the atmosphere across the EP is dark and brooding. Check out the tracks below and grab yourself a copy from your favourite vinyl or digital outlet! Italian producer ARP XP is a new name for us here at TEB, but his debut LP (out on French label IM:Ltd) shows him as one to watch. The album is a showcase of the producer’s versatility, crossing styles and tempos while retaining a unified, deep vibe. From the soulful half step stylings of titular opener Closer through dark steppers like Sickness of Time and deep rollers (Surrealism and Keep Your Head Up High) the album represents the diversity present in modern Drum & Bass aptly. Elsewhere on the record, ARP XP explores the ~130 BPM tempo range to good effect on Curiouser and What We See. Check out the album below and grab it on CD or Digital from your favourite record store! Concord Dawn have been a firm feature of the Drum & Bass scene since the late 90s, representing New Zealand alongside the likes of The Upbeats. Not content with releasing their 6th full length record, they decided to give it away for free – all you have to do is give their Facebook page a like and you’ll get the whole album in high quality MP3 format! The album is full of up front dancefloor oriented tunes, and features some heavy bass and uplifting melodies. Our favourites here at DNB Dojo are Electrocute, Heartburn and Tear Down The Sky (featuring the mighty Jade). What do you think? Check out the whole album below and let us know your favourite track! Craggz & Parallel release their latest EP Product Placement today and to match it they’ve put together a cracking video for opening track Hurt You. The track features some absolutely superb drum work and nice atmospherics, while the video is all superb swift edits and x-ray imagery (though with the flashing images, epileptics might do well to avert their eyes). Check out the video below and grab the EP from all good record stores! HURT-YOU from Loner Films on Vimeo.